On July 15th, Chronus Art Center will host an Open Studio event of current Research and Creation Fellowship artist Andrej Boleslavský. 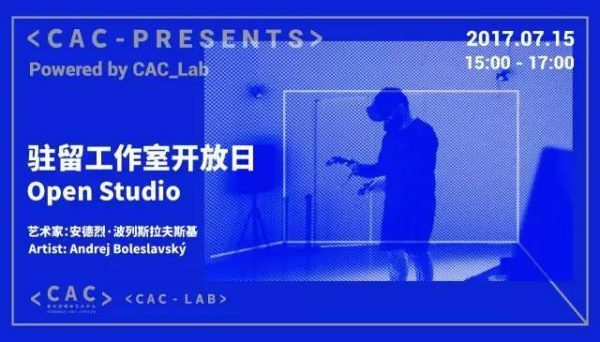 Starting with the artist talk, Andrej Boleslavský will guide the audience through the artworks he previously realized, from interactive installations through light design to virtual reality experiences. He will also cover the prototyping and development process of the artwork Hide&Seek, which is being developed during the fellowship using OptiTrack motion tracking system. After the artist talk, the audience will have a chance to try the work in progress version of the Hide&Seek, a game that aims to bring social aspect into the virtual reality or better say mixed realityexperience. Created in cooperation with Renaud Wiser Dance Company, Patricia Okenwa and Mária Júdová, it is thematised by how digital technologies change our perception. It focuses on the emergence of tactics and strategies in relation to digital media and it analyzes on patterns of behavior that are significant in the online environment, and the roles that we take on social networks. Goal of the game is to find player. Andrej Boleslavský is current art and research fellow of Chronus Art Center. He is an independent artist purposing technology in the fields of new media art, interactive design, physical computing and 3D printing. His work also maintains a strong fascination with the entanglement of nature and technology. In the recent works in collaboration with Mária Júdová he takes strong inspiration from contemporary dance and they are realized with the medium of virtual reality.